Theresa May is to face MPs' questions about her decision to authorise air strikes against the Syrian government.Opposition parties say MPs should have been consulted before the UK joined the US and France in bombing three Syrian sites, in response to a suspected chemical attack on the town of Douma.Labour has called for the law to be changed for any future interventions.Foreign Secretary Boris Johnson promised MPs would have "abundant time" to have their say.Sites near Damascus and Homs were hit on Saturday in response to the alleged chemical attack on Douma on 7 April. UK prime ministers do not legally need to consult Parliament before launching military action, although they have done so since the 2003 invasion of Iraq.Mrs May is due to give a Commons statement on Monday before facing questions from MPs.She is also expected to ask the Speaker for permission to hold an emergency debate in Parliament on the issue of Syria. BBC political correspondent Ben Wright said if approved it would be up to the opposition parties to decide if they wanted a vote at the end of the debate.He said with or without the vote it would be "largely symbolic" and would mainly just acknowledge that Parliament has had its say.But it would not give MPs the chance to formally approve or reject the air strikes themselves, says the BBC's political editor, Laura Kuenssberg.Her decision to authorise action without MPs' backing has been criticised by Labour leader Jeremy Corbyn, who said she could "easily" have recalled Parliament or delayed her decision until MPs returned to Westminster from the Easter recess.Mr Corbyn called for a new War Powers Act "so governments do get held accountable to Parliament for what they do in our name". This was dismissed by cabinet minister David Lidington, who told ITV there were "no plans" to change the law. "Governments have to bear in mind the need to be able to act swiftly and flexibly and to protect the safety of our servicemen and women," he added. The Scottish National Party said it would table a motion for an emergency debate to try to get MPs a vote on whether they backed the action.Mr Corbyn, who has warned of an escalation in a "proxy war" between the US and Russia, said he would only consider backing intervention in Syria with the support of the United Nations. 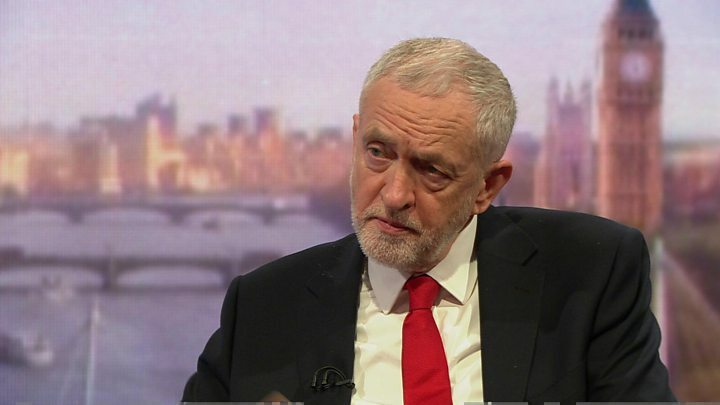 "If we could get to a process in the UN where you get to a ceasefire, you get to a political solution, you then may well get to a situation where there could be a UN force established to enforce that ceasefire," he told the BBC's Andrew Marr Show on Sunday. "That surely would save a lot of lives. "But the Conservatives said he knew "full well" that Russia would veto such a move. Downing Street published its legal case for its part in the strikes, stating that the action was legally justified on humanitarian grounds.And Mr Johnson defended the strikes in his appearance on the Marr show, stressing the "limits" of what the UK was seeking to achieve.The intervention "is not going to turn the tide of the conflict", he said, adding that it was about stopping the erosion of the "taboo" of chemical weapons. On Saturday, the Ministry of Defence said eight Storm Shadow missiles had been launched by four RAF Tornados at a former missile base, 15 miles west of Homs.It is thought President Bashar al-Assad's regime had been stockpiling materials used to make chemical weapons there, it said.The MoD added the facility was located "some distance" from "concentrations of civilian habitation", and the risk of contamination to the surrounding area had been minimised.The UK and US have said the strikes were successful, with President Trump warning the US is "locked and loaded" for further action if there are more chemical attacks.On Saturday, the UN Security Council rejected a resolution drafted by Russia, while all Nato allies have given the military action their full support.There has been no confirmation of any civilian casualties.